Flagstones that once lined the platform at a Lancashire railway station are helping walkers keep on track in the Yorkshire Dales. 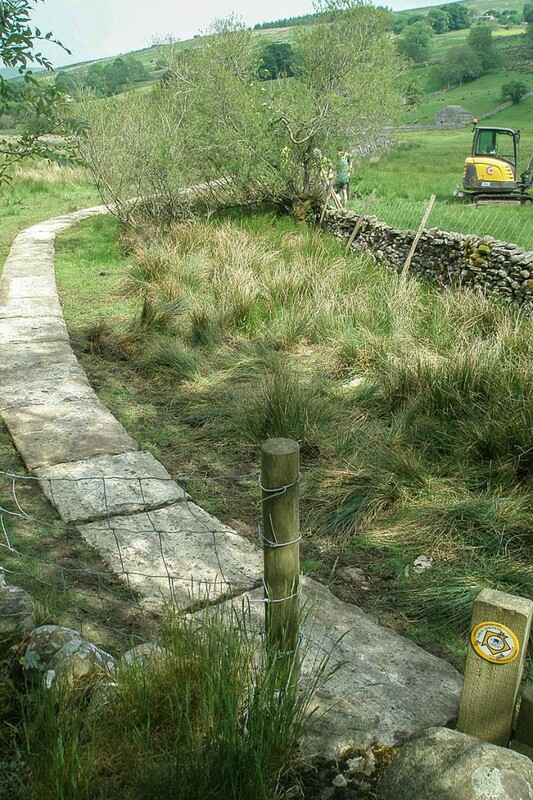 The stones are been used at five sites in the national park to improve rights of way. Building contractor J Murphy and Sons donated three trailer-loads of the redundant flagstones, which were removed from Kirkham and Wesham station between Preston and Blackpool. Yorkshire Dales National Park Authority said the flags have now been laid, improving the condition of about 400m of paths. It said the stone has been used at popular places which were notoriously boggy, such as by Aisgill Force near Gayle and at Buckden Pike summit. The authority’s area manager for the southern Dales, Kate Hilditch, said: “It’s becoming harder and harder to source Yorkshire stone flags, so we were delighted and grateful to receive this donation from Murphy. Whernside, Chapel-le-Dale. The remainder of the flags are currently being installed on a path on the Three Peaks Challenge route, near Bruntscar Farm, to provide a sustainable surface. Murphy’s site manager Mark Rittenberg said: “We wanted to do something with the left over stone from Kirkham that would mean it wasn’t wasted and would also benefit the wider community.